Due to your unique needs, it is best to choose a dentist who understands the struggles that you face. Pick a dentist who caters to his patients’ individual comfort levels. In addition to a warm and welcoming environment, they should take the time to talk with you about every aspect of your treatment to help you relax. They will answer your questions and address your concerns to give you the peace of mind you need. To choose a La Porte dentist to care for you, ask your friends and family for recommendations. They can give you first-hand accounts of the care and treatment you can expect when visiting their office. For further reassurance, take the time to read online reviews and testimonials from current patients to learn more about the care you can expect to receive. The fear of the unknown can help to fuel your anxieties. To help calm your nerves, visit the dental office prior to your appointment. This provides the opportunity to get a feel for the atmosphere while also meeting the staff who will be taking care of you during your time in the office. 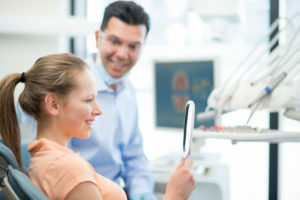 To head into your appointment feeling secure and confident, take the time to ask the dental team and the dentist any questions that you may have. The more prepared you feel, the more comfortable you will be during your appointment. If you need a little extra help relaxing during your appointment, it may be time to consider sedation dentistry. Among the most commonly used is nitrous oxide. This is an inhaled sedative that takes effect quickly while having few side effects. You will sit back and relax while your dentist performs the necessary cleaning and checkup. You do not have to let your dental fears stand in the way of getting a healthy smile. You can conquer your anxieties with the right dentist by your side. Since 2013, Dr. Daniel Berquist has provided comprehensive dental care to the community. He focuses on patient comfort while delivering customized solutions to help them reach and maintain their oral health goals. Due to his advanced training, he offers many areas of specialty, including sedation dentistry. If you need help relaxing during your appointment, he can help. Contact Region Dental today to learn more.